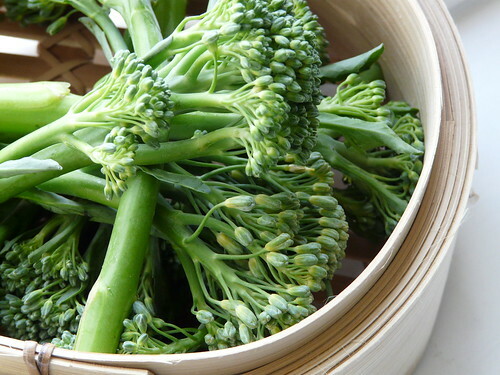 There’s a recipe for Chargrilled Broccoli with Chilli and Garlic in the Ottolenghi cookbook. I’ve made it a few times and it is fabulous. It’s also a bit of a fouter though and on week nights I usually can’t bothered with it. So, a few months ago I took the basics of the recipe and simplified the whole process by foregoing the chargrilling thing and just mixing steamed broccoli with a rather pungent oil. The result was that D has told me in no uncertain terms never to serve him broccoli in any other way again. 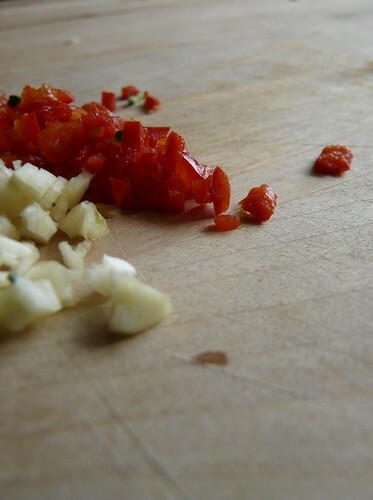 Add the oil, garlic and chilli to a cold frying pan. Turn the heat onto medium. Fry the garlic and chilli until the garlic begins to sizzle. Turn the heat off and leave on the stove for another minute. Pour the contents of the frying pan into a glass bowl and whisk in the salt. Meanwhile, steam the broccoli until cooked to your liking. I usually like a bite in my veg but for some reason I prefer this dish quite soft. Toss the broccoli with the flavoured oil and serve immediately. Fouter, now that’s a splendid word. Oh, yes. Fouter’s going straight into my conversation. Delish. Always looking for new ways with broccoli. Bookmarked. That broccoli recipe is fantastic, I made it last weekend. But gosh it’s a lot of work for broccoli. I do like your idea of simplifying it, but still serving with a hefty tasting oil. Great thinking. I’d probably add in the slivers of lemon from the original, as I think that was my favourite part. Fouter is a wonderful new word (the last one I learnt was the name of a US senator colloquially used to describe…something not very savoury)! Yum – this reminds me of a green bean dish I first tasted from a Whole Foods store here in the U.S., which is now in regular rotation in my kitchen. I’ll definitely give it a whirl with broccoli. And thanks for the “fouter” definition! That sounds like a great broccoli dish. I’ve gotta try it! you have to try the roasted broccoli with parmesan, lemon, pine nuts and basil on my blog – it’s nicknamed best broccoli and has been rocking my work for the past few months. Broccoli is my favourite veg. Its Vietnamese name is really nice – green flower (or green cauliflower). I love this simple recipe. Yay for getting your man to like veg. Gotta work on mine. Johanna – That sounds delicious. You know how I feel about cheese! Lucy – It’s a cracker. Especially since it can be a verb, an adjective or a noun. Kathryn – The lemon… I forgot about the lemon. Shall try that too. AOF – My mind is now working overtime imagining what that senator’s word was! Lee – Love green beans too. Shall try this oil with them next time. Abby – I shall indeed try that out. Sounds amazing. Anh – D’s definitely warming more and more to veggies. He never disliked them before but now he occasionally gets excited about them! Ooh yum, that sounds good. I have become a bit obsessed with broccoli lately (even though I can never remember how to spell it – two ‘c’s or two ‘l’s?!) so this might be just the thing to have this weekend!